Easter News - Going Fishing! How Many Fish Did They See? From Below: "..Lost production, spawn that did not occur, was therefore one-hundred million pounds greater than all For-Hire catch in the entire Mid & North Atlantic combined. .."
First Spring Reef Building Trip: Need a half-dozen volunteers to help load reef-blocks on Tuesday, 4/22/14 - Start WORK at 7:30 AM. Will try the tog for an hour or so after deploying blocks. This is a reef building, mooring deploying, crew training, go see what the bite's like trip. Charging $30.00 per-person to help defray expenses. Tow-Boat US Loaded the Reef Foundation's Barge with a truckload of pipe Saturday. Now they need a mooring at Lindsey's or Ake's Reef so they can deploy it. Tog Fishing! Inshore Trips - Thursday, Friday & Saturday – 6:30 to 3:30 Each Day - $110.00 Per-Person – Twelve Anglers Sells Out – Green Crabs Provided. New deckhand, but long-time local angler; Bill found and repaired a hydraulic anchor winch leak that I've had since I bought the boat. That was in his first 4 hours on the job. Nice. Changing hose clamps as we do every spring; hunting engines' weeps & seeps, looking for trouble before it becomes trouble. Boat's almost ready for season. Still need to find another deckhand, a year-round hand. 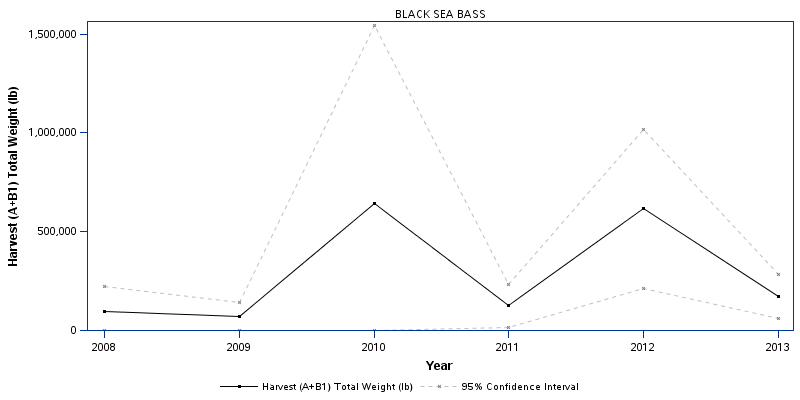 After many requests, I recently received the "Observed Harvest" data used, in part, by MRIP to calculate state by state sea bass landings in two-month periods. Here is the precise definition of these "Observed Harvest" numbers. They're not the only data that make-up an estimate. 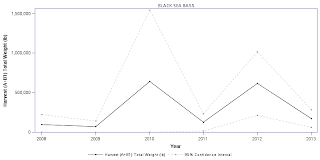 "Black Sea Bass 'observed' in the Angler Intercept Survey, “Count of fish that were caught, landed whole, and available for identification to species and enumeration by the interviewer. These fish were available for weighing and measuring." To fashion the estimate that quite-nearly triggered Accountability Measures, the main estimate that almost closed sea bass for all of 2014 and set managers in a multi-month struggle to save at least part of our fishery; That estimate's foundation is based in large part on Field Observers seeing just 6 sea bass among private boats in Massachusetts during May/June, 2012. Those 6 fish – which were reported accurately by field interviewers who were doing their job correctly – Those 6 cbass, after complete statistical digestion, became over 600,000 pounds of quota-crushing sea bass. In 2013, during the summer immediately following Hurricane Sandy, NY & NJ Private Boats had, at least statistically, incredible sea bass fishing. Much higher than Massachusetts' numbers above, these private boat catch-estimates are based on field interviewers seeing 41 sea bass in New Jersey & 70 in New York. That private boats waylaid sea bass last summer is an amazing result indeed considering professional effort met with their lowest two-state average catch in a decade. In fact, MRIP claims New Jersey Private Boaters had one of their top-five years of the last three decades, while NJ's Party/Charter skippers had their lowest catch for those same 30 years. I really hadn't thought New Jersey Party/Charter skippers had grown unwilling to catch abundant sea bass. However, sourcing opinion only from the catch estimates, one would have to reach that conclusion. Or, as I have asserted since 1998, perhaps its better to assume the data contains outliers. They're apparently very well–known to statisticians who have devised many treatments for them. Now to get fishery managers to understand their responsibilities in sorting the wheat from the chaff and helping the statistical community to devise better methods of catch calculation. Then too there's a Percentage Standard Error assigned by statisticians to every estimate. PSE is quite similar to "Margin Of Error" in a political poll – except for catch-estimates they're huge. There is no catch-estimate, none at all, that would be acceptable by political poll standards. Here's a table with the Massachusetts Private/Rental estimates for recent years. When the PSE column is greater than 50 that means the estimate's "margin of error" is greater than 100%.. You have to double the PSE.. Note also the exact figures for "Observed Harvest" that I've added in the right hand column. Here, for those same estimates in the table above, is a weight estimation graph that includes PSE values. An estimate is not more likely to be closer to the so-called 'centerpoint.' An estimate is just as likely true anywhere within PSE's full range.. NOTE: Most estimates come close to zero on the low end of PSE. Here readers can see where the two sea bass (2) observed by field interviewers in May/June 2010 were then magically converted to 650,000 pounds of Massachusetts Private Boat catch by centerpoint. If, however, PSE –the 95% confidence interval- is considered, then management's assumption of 650,000 pounds must more-truthfully become "Between 0 & 1,550,000 pounds of recreational catch." As I detailed in my 3/16/14 report, every single regulatory tightening of sea bass can be traced to these spikes, these outliers, in the estimate tables. Management has not used the full PSE spread since before sea bass regulation began. PSE spreads left so much room for argument that argument filled the room – progress was very slow creating regulation during those early years. Statisticians claim their answer is 95% certain. They claim their answer to "How many fish did them boys catch?" is never a centerpoint. Their answer always includes the whole PSE range. Truthfully, I think we need to repair MRIP's estimates. I think we need to create filters, probability filters, that flag outliers in the estimates. I think a very fine filter can be crafted by first seriously polishing the For-Hire estimates – we professionals do, after all, submit catch data for each trip – and then comparing For-Hire catches to a well-researched "Percentage of the Fishery" calculation to quickly check Private Boat and even Shore catch-estimates. If, for instance, surveyed recreational fishers think private boats catch 35% of a certain species, but an estimate comes through the system far higher or lower, a red flag is raised. A "percentage of the fishery" flag would surely arise in 2013's New Jersey, July/August, Party/Charter estimate. If the For-Hire fleet was trying to catch sea bass and really having a hard time of it, if they truly had their worst sea bass summer in almost 30 years, then the assertion New Jersey's Private Boats had among their best fishing ever would be flagged for closer examination. Instead, it was fashioned into a club to beat more regulation into the recreational fishery. For fishery science to truly move forward, we need to get much closer to the truth of recreational catch. We already repaired sea bass once. Not an estimate; fishing was unbelievably good in the late 1990s & early 2000s. We effected that repair with no real closed season & much less overall restriction in size limit or bag limit. We grew the population from 13 million pounds to almost 40 million while taking practically all the sea bass we wanted. Clients & I could sometimes catch limits of sea bass in 2002/2003 using bare hooks. In fall especially, when sea bass were moving offshore, I'd sometimes use two huge silver 13/0 tuna circle-hooks with no bait to catch a limit of nice sea bass..
Jigging a limit, using an artificial lure instead of bait to catch 25 keepers, was practically an everyday occurrence. The sea bass population grew like crazy even when there was no limit, when guys who were stopping at 25 didn't have to stop at all. Now the sea bass population has declined from almost 40 million pounds to 26 million pounds despite tighter & tighter restriction & despite overfishing being a distant memory. Regulatory-ratcheting sourced only from outliers in the recreational catch-estimates; tighter regulatory constraints constantly create greater economic pain. This while the biological effect of greater catch-restriction further reduces spawning production. Size limit protected; we have some pretty cbass today, some nice sized ones. But jumbo sea bass were far more prolific as production peaked in the early 2000s despite smaller size limits. Had spawning production remained apace throughout this recent decade of regulation-increase/population-decrease; if the same number of eggs had been fertilized through this period as in the late 1990s, the sea bass population would have swollen with mind-numbing success. I thought I'd try to calculate the number of sea bass that I believe have not been spawned because of size limit regulation since 2003. With simple 'back of the envelope' accounting, I calculate lowering sea bass spawning production has cost 106 million pounds of lost sea bass since 2003 — fish that just were not spawned. This is a straight line calculation. It does not account growth of unharvested fish, or additional spawning production from a greater population of spawning participants, nor the habitat production increase associated with the addition of vast rocky areas of southern New England. This 106 million pound loss is calculated using only the production absent since 2003. The true weight of lost production, the real weight of fish that have not been spawned, would be far greater. To contrast this 106,000,000 pounds of lost production, please consider the 8,913,000 pounds of Party/Charter landings from the the same decade since 2003. Lost production, spawn that did not occur, was therefore one-hundred million pounds greater than all For-Hire catch in the entire Mid & North Atlantic combined. If you factor in MRFSS/MRIP's lunacy, the private boat estimates at 16,220,000 pounds for the decade, you have 25.133 million pounds. Reducing the Private boat values so they equal the For-Hire fleet--rough, but more likely--creates a recreational total of 17,826,000 pounds. One-hundred six million pounds of sea bass that would have become part of our a well-restored fishery had managers not responded with an iron-fist to each fantastic outlier in the catch estimates. Clients & private boaters could have caught & kept a lot of those unspawned fish. An awful lot of them. Though we still have an incredible effort ahead to reach a sea bass population as represented by commercial landings in the 1950s, allowing for production as it might have been creates more sea bass than ever before in recorded recreational landings. Management's failure to grasp biological production's importance has created at least 6X greater negative impact than recreational extraction. That's a lot of lost fish considering they are tasked with restoration. Squandered economic value is extraordinarily high as well. Calculating only recreational For-Hire along the Mid-Atlantic from quota decrease since 2003, I'd conservatively estimate just over 40 million dollars in lost party/charter sales since 2003 from NY south to Cape Hatteras. That low figure is for party/charter sales only, it does not include any lost economic benefit associated with tourism or the vast sums generated by private boaters. I have no means to calculate those numbers. Decreased quota also creates a reduction in Commercial landings. Again not calculating gains of increased production, simple calculation shows a loss to commercial across-the-dock sales of roughly 38.5 million dollars. Though I couldn't guess how to estimate it, there has to be a lot of lost tax dollars in 78.5 million dollars. Maybe not real money in DC, but enough to pay a lot of fisheries staff. "Wait a minute there Capt. Monty! How can you assert these 106,000,000 pounds of lost sea bass production are management's doing?" How dare I say that indeed.. Everyone knows fish declines are always because of overfishing. You can plainly see in the estimates how private boats routinely take more than even Commercial & recreational For-Hire combined. While it may be true that a larger female fish will have larger ovaries that hold more eggs, its also true that a year-class of newly spawned juvenile sea bass is obviously at its greatest population early in life. I think by pushing age at maturity out by two or more years we're, literally, keeping millions of sea bass out of the spawning population. I think supporting evidence is very clear for this thesis. Thankfully, some scientists & managers are now considering methods of experimentation to test it. If you count all the fertilized eggs that survive to 6 months, and count those survivors again every six months; if you follow that year-class to, say, age five - you'll naturally see a diminishment in the number of individuals over time due to fishing extraction, predation, disease & starvation. There will be far fewer sea bass remaining in the age 5 year-class than there were at age six-months or age one. It's not population density that controls what age sea bass begin spawning. Age at maturity (spawning age) would have quickly regressed in 2004 if population-density controlled maturity. Its the size of the fish on any given reef that triggers accelerated/regressed - younger/older spawning participation. My assertion that management worked extremely well early on, with success beginning even before real legal control began owing to our own efforts of self-regulation, is because a huge percentage of the marine sea bass population was spawning. Virtually every sea bass in the ocean 8 months & up (& not juviniles in an estuary) was in the spawning population up until the year 2000. Now, because of size limits shooting past 11 inches in the guise of "restriction necessary to prevent recreational overfishing," sea bass are not even starting to spawn until age 3 or more. That's exactly when they become legal to recreational fishers and a year after they became legal to commercial effort. With spawning production thusly curtailed, though inadvertently, by regulation; the spawning stock biomass (SSB) has shrunken to ineffectiveness. This is how tighter & tighter regulation has resulted in fewer & fewer fish. By artificially keeping a few age 3 & 4 sea bass on every little wreck, rockpile & artificial reef, we have sea bass convinced they're at habitat capacity. Sea bass are behaving as though they have to retard their spawning or they'll starve. Sea bass, in natural response to present day regulation, are instinctually self-limiting their population. It is very much true that the sea bass population grew exponentially under far less regulation & that the sea bass population has shrunken with far greater regulation. In a natural, unfished state, a spawning slow-down would be a perfect response to seeing other large cbass on a reef. But we are fishing. Calling our GPS guided, two anchor precise, fluorocarbon & micro braid based extraction "Natural" pushes truth to the edge. Sea bass are getting their cue to slow spawning down, that's locked-in by size limit regulation. But we are taking, removing, extracting, these instinctually slowed-down spawning sea bass just as they enter the spawning population. Even though a perspective based on factual recent history clearly shows our modern levels of extraction create far less fishing pressure, the spawning population is shrinking and becoming far less effective at replacing sea bass we've taken.. If scientists had true information; a perfect set of signals ranging from abundance, to spawning production, to habitat quality, to removals; then, over the years, managers would have had the information needed to sense a more proper regulatory course. All of fisheries' scientific information is shrouded by water. Some ignorance is made worse by managerial expedience. While we do have some sense of abundance, spawning production, and commercial extraction; Science has sadly given managers no sense of sea bass habitat and how that habitat might be made better, nor habitat's value to increasing spawning success. Perhaps more sadly; science, in failing to pound-away at PSE, has completely mislead the management community where recreational catch-estimate accuracy is concerned. If experimentation will begin on sea bass age at maturity & be applied by management next year, I believe the population can be doubled by 2017. That would create a higher population than we've known, but they'd be spread more thin owing to habitat expansion in Southern New England and beyond. Still, once mangers have grasped and utilized this important tool – age at maturity, any reef fish can be swiftly grown to habitat capacity. Then, by adding/building more habitat, the population can be carried higher still. See ocreefs.org to help add habitat. Management will catch up. Write a letter to your DC Representatives & Senators to fight bad use of bad estimates. My time for working on such things is closing. Bank says I have to go fishing. Its way more fun anyway. See below for Wiki's take on "Statistical Outliers." In statistics, an outlier is an observation point that is distant from other observations. An outlier may be due to variability in the measurement or it may indicate experimental error; the latter are sometimes excluded from the data set. Outliers can occur by chance in any distribution, but they are often indicative either of measurement error or that the population has a heavy-tailed distribution. In the former case one wishes to discard them or use statistics that are robust to outliers, while in the latter case they indicate that the distribution has high kurtosis and that one should be very cautious in using tools or intuitions that assume a normal distribution. A frequent cause of outliers is a mixture of two distributions, which may be two distinct sub-populations, or may indicate 'correct trial' versus 'measurement error'; this is modeled by a mixture model. Naive interpretation of statistics derived from data sets that include outliers may be misleading. For example, if one is calculating the average temperature of 10 objects in a room, and nine of them are between 20 and 25 degrees Celsius, but an oven is at 175 °C, the median of the data will be between 20 and 25 °C but the meantemperature will be between 35.5 and 40 °C. In this case, the median better reflects the temperature of a randomly sampled object than the mean; naively interpreting the mean as "a typical sample", equivalent to the median, is incorrect. As illustrated in this case, outliers may be indicative of data points that belong to a different population than the rest of the sample set. Estimators capable of coping with outliers are said to be robust: the median is a robust statistic, while the mean is not.